Fruit Cereal by Mad Hatter Juice is a beautifully nostalgic liquid that perfectly captures the taste of the fruity milk left over after you've finished a bowl of cereal. Creamy, sugary and absolutely irresistible, Mad Hatter's Fruit Cereal vape juice is a flavor-filled trip down memory lane. 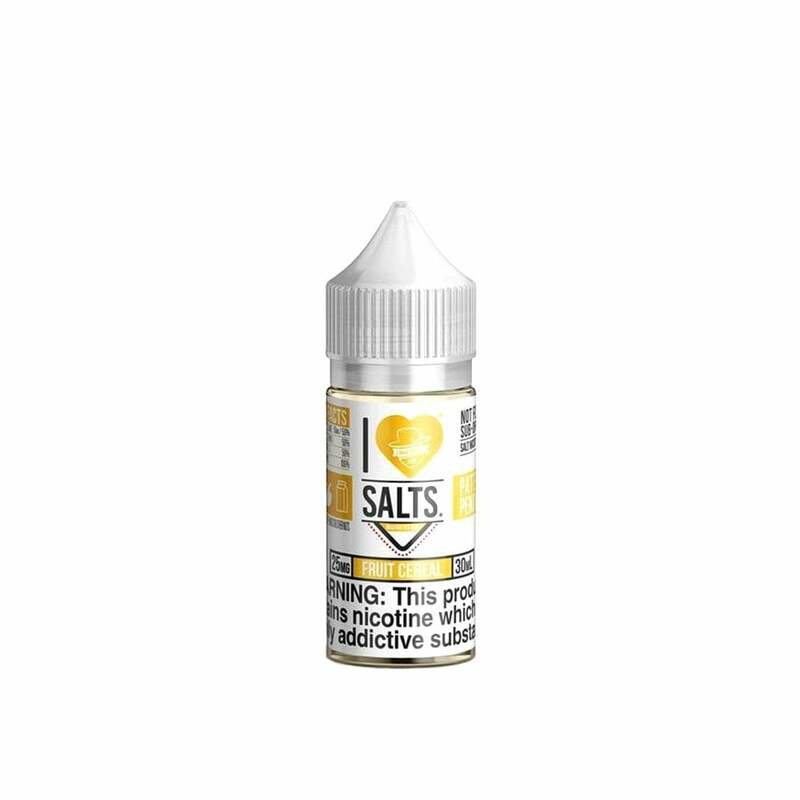 Its nic salt formula adds an extra dimension to this juice and delivers a quick nic rush that'll leave you totally satisfied. I LOVE THIS VAPE JUICE! It tastes identical to fruit loops! I tried the Rainbow Road salt nic juice that was recommended to me by a local vape vendor and it was terrible. I was worried that perhaps all the fruit cereal flavors of e-juice would be bad - but boy was I wrong! I Love Salts has nailed this flavor. It's my new all day vape. Highly recommend for those looking for a fruit cereal flavored salt nic or just someone looking to try something new. I LOVE IT!! This is a favorite of my husbands. Tastes just like fruit cereal. Amazing flavor not to over the top sweet, hits the "sweet" spot definatly one of my favorites. Awesome Flavor! Pretty much what you would expect it to taste like - Fruity Pebbles. I got mine in 25mg. Also, Thank you Electric Tobacconist! This is my favorite site for all online orders. Shipping is always so fast, and prices are great! 6th March 2019 - Shaun S.
This was the first vape juice I ever tried so maybe I'm biased but it's definitely one of my very favorites. I think it tastes like fruity pebbles and even a touch of cornflake like real cereal. I love this flavor and order all the time. It's definitely one of my go to's. I don't like any other fruit cereal nic salt juices as much as I like this. Lemon is one of the most prevalent components to the flavor, but it's not overpowering it's just.. fruity. This is my go to flavor. I love it. Especially here on E.T. because they have the lowest prices! Flavor is a bit off, not quite a cereal flavor, but still a solid juice with a smooth hit. Would recommend for the type that enjoys a smooth nic buzz. Love the taste. Tastes like fruity pebbles cereal. Didn't like this one at all. I actually got rid of it because it was so bad. Sorry that I wasted a coil on this one. A bit strong, even for a guy who likes strong flavors.